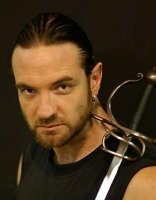 Kyle Rowling is a professional Actor, Director, Weapons Master and Fight Director. He has twenty-five years of experience in various Martial Arts including Chinese and Japanese styles and has been working as a Fight Director for over a decade. In that time he has trained, choreographed and performed Stage Combat for STC, Opera Australia, Ensemble Theatre, Belvoir St, Marion St, Bell Shakespeare, the David Atkins Group, Sydney Shakespeare Globe and many more. He also teaches and choreographs regularly at most of Sydney’s top acting institutions including NIDA, VCA, the Actors College of Theatre and Television, the Actors Centre Australia, The Australian Theatre for Young People and Screenwise. Kyle’s Stage Combat and performance skills have also secured him work in many theatre and film productions including “Star Wars EP II and III” as Christopher Lee’s fight double, Eric Bana’s personal weapons trainer for “Troy”, fight director and performer for the 2000 production of “Pan” at Sydney’s Capitol Theatre and the 2001 New York tour of STC's “The White Devil”. Kyle is Fight Director and Founder of The Action Acting Academy in Sydney, Australia.